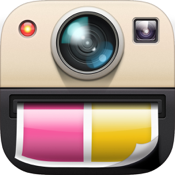 Framatic by Lotogram helps you frame all your favorite photo memories. This app was formerly known as InstaFrame and allows you to instantly add all kinds of fabulous frames and borders to finish off your photos. When you're finished you can share the pictures on Facebook, Instagram, Twitter, and Flickr. Features of this app for combining photos and framing them, include being able to create your own framed work of art using pictures. Go ahead and pick from the different frame layouts and themes then arrange your photos the way you want. You'll be able to swipe, zoom, and pinch to position your photos in the exact right way. You can also add effects to individual photos. Additional features include being able to select from more than 1,000,000 colors for the background, there are 25 Instagram borders, 36 adjustable layouts, nine effects, and 40 background patterns. You can adjust the border width, round off the picture corners, and create a shadow. View online tips for each of the pages to help you create the ultimate composition. Shake the device to get a randomly generate picture frame, and even group your photos together by location and time. The app supports auto-save of your projects so you don't lose your work. Framatic was updated on May 18, 2013 and currently has 735 customer ratings with an average rating of four and a half out of five stars. I was left very impressed with how wonderful my photos came out. I liked that even when you combine photos on iPhone, you could still manipulate them individually creating a truly unique look. For: iPhone 3GS, iPhone 4, iPhone 4S, iPhone 5, iPod touch (3rd generation), iPod touch (4th generation), iPod touch (5th generation), and iPad with iOS 5.0 or later. Framatic is optimized for iPhone 5.